The live stream will be available to watch on this page, and it is being hosted by Google+ Hangouts On Air through YouTube. Furthermore, the live stream will be available for free on YouTube for a period of time after the debate. In support of our ongoing relationship with the deaf community the debate, with nationally certified ASL interpreters, is available at debateliveASL.org. The event is also recorded for DVD and digital download distribution to help offset significant costs in organizing and sponsoring the debate. Although the immediate release of the DVD will be subtitled, it will not include the ASL interpreters, but we may add this at a later date. Sign up for the event on this page and we will update you by email if this becomes available. 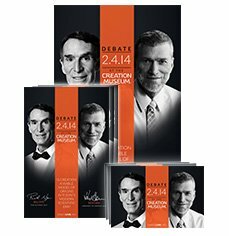 Your school, church, or group can to use these free resources to help promote the free live stream of the February 4 debate. Also, be sure to check out our special affiliate program for debate-related products.